The CAF Champions League is an annual continental club football competition run by the Confederation of African Football (CAF). The top club sides from Africa's football leagues are invited to participate in this competition, which is the premier club football competition in the continent and the equivalent to the UEFA Champions League. Due to sponsorship reasons, the official name is Total CAF Champions League, with Total Champions League also in use. Egypt's Al Ahly SC is the most successful club in the competition's history, having won the tournament eight times. Egyptian clubs have accumulated the highest number of victories, winning the title 14 times. The reigning champions are ES Tunis of Tunisia, who secured their third win in the competition after defeating Al Ahly SC in the 2018 final. Starting life as the 'African Cup of Champions Clubs' in 1964, the first team to lift the trophy was Cameroonian side Oryx Douala, who beat Stade Malien of Mali 2-1 in a one-off final. There was no tournament held the following year, but the action resumed again in 1966, when the two-legged ‘home and away’ final was introduced, which saw another Malian team AS Real Bamako take on Stade d'Abidjan of the Côte d'Ivoire. Bamako won the home leg 3-1 but it all came apart for them in the away game in Abidjan as the Ivorians went on to win 4-1 to take the title 5-4 on aggregate. In 1967 when Ghana's Asante Kotoko met the DRC's TP Mazembe, both matches ended in draws (1-1 and 2-2 respectively). CAF suggested a play-off, but the Ghanaians refused to compete and the title was handed to Mazembe, who went on to win the title again the following year. The 1970s saw a remarkable rise in the fortunes of Cameroonian club football, which created the platform of success enjoyed by Cameroonian football at international level today. Between 1971 and 1980 Cameroonian teams won the cup four times, with Canon Yaoundé taking three titles (1971, 1978 and 1980) and US Douala lifting the cup in 1979. In between the Cameroonian victories the honor was shared with another team enjoying a golden age, Guinean side Hafia Conakry, who won it three times during this period (1972, 1975 and 1977). Apart from the introduction of the away goals rule (in which the team wins which has scored more goals playing ‘away’ if there is a tie in the aggregate score line over the two legs), very little changed in this competition until 1997. In this year, CAF took the bold step to follow the lead established a few years earlier in UEFA by creating a league stage in the tournament and changing the name to the CAF Champions League. CAF also introduced prize money for participants for the first time. With a purse of US$1 million on offer to the winners and US$750,000 to the losing finalist, the new Champions League became the richest club competition in Africa . In the new format, the league champions of the respective CAF member countries went through a series of preliminary rounds until a last 16 stage. The 8 winners of this round were then drawn into two mini-leagues of 4 teams each, with each team playing each other on a home and away basis. At the end of the league stage, the top two teams in each group meet in the semifinals, with the winners going through to contest the finals. In 2017, the group phase was expanded from 8 to 16 teams and the mini-leagues from 2 to 4 and the addition of one extra knock-out round. 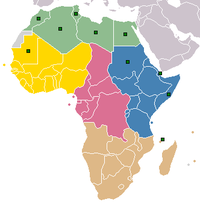 In 1997 the CAF Champions League replaced the previous pan-African competition, the African Cup of Champions Clubs; this had run from 1964–1996. The competition is open to the winners of all CAF-affiliated national leagues, as well as the holder of the competition from the previous season. From the 2004 competition the runner-up of the league of the 12 highest-ranked countries also entered the tournament creating a 64-team field. This was in response to the merging of the CAF Cup, the secondary pan-African club competition where the league runners-up would previous play, with the CAF Cup Winners' Cup to create the CAF Confederation Cup. The 12 countries would be ranked on the performance of their clubs in the previous 5 years. The Champions League operates as a knockout competition, with a final group stage, with each tie (including the final) played over two legs - home and away. There are 2 knockout stages: the preliminary stage and the first round (32 teams). The 16 teams knocked out of the first round are entered into the Confederation Cup to play against the final 16 teams in that competition. After the first round, the last 16 teams are split into four groups of 4. The winner and runner-up in these groups are sent to play in a quarter-final and the possibility to play semi-finals, in chase of victory, for the chance of contesting the final. In July 2016, Total replaced Orange and has secured an eight-year sponsorship package from the Confederation of African Football (CAF) for a value of €950 million to support ten of its principal competitions, including the CAF Champions League, renamed Total CAF Champions League. In 1997, the CAF introduced prize money for the eight participants in group stage for the first time in a club competition in Africa. * Note: National Associations receive an additional equivalent share of 5% for each amount awarded to clubs. ^ "CAF partner and sponsors". cafonline.com. ^ "Asante Kotoko, the great porcupines of Africa". fifa.com. ^ "CAF Executive Committee decisions". cafonline.com. 2009-09-16. Retrieved 2010-02-12. ^ "Prize money for CAF competitions effective 2017". cafonline.com. Wikimedia Commons has media related to CAF Champions League.